The perfectly harmonised words with the music produced from the strings of Sarangi, a Gaine (person who sings by playing the Sarangi) sings: Jaati pitchhau pita baru tehi malai sahi chha, bhabanama chota lage antarghata hundu rai chha, maryo malai nisthuri mayale (you can slap me if you want. Being injured emotionally means to suffer heartache. Malicious love marred me). He sings in his melodious and mellifluous voice. The song is so powerful that I am almost nostalgic. Like D H Lawrence wrote in his poem “Piano” thus: “my manhood is cast down in the flood of remembrance. 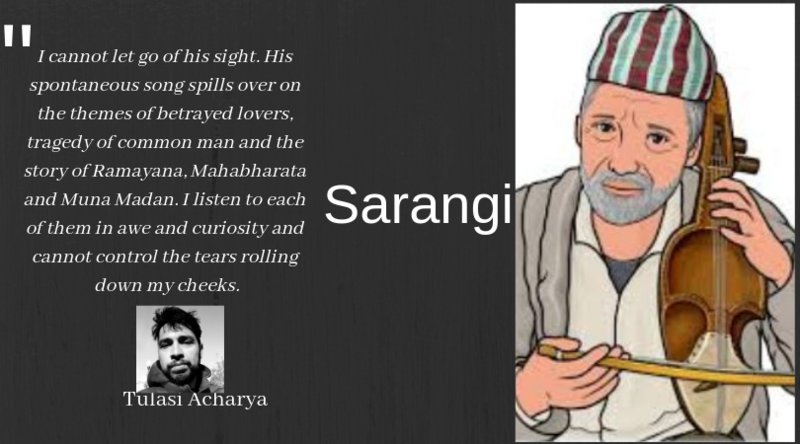 I weep like a child for the past.” I just cannot help being emotional by the melodious Sarangi tune. I hear this Gaine singing incessantly and fall in love with him and his music. He holds me spellbound. I stop and stand as a statue, and then stare at his musical instrument. Surely, he is a Gaine who is sharing his sorrows and miseries, dreams and desires with the pedestrians. He lives on the footpath, selling his throat and art, and scrounging for whatever little he can amass. All this he does not for entertainment, but to earn his daily bread and butter. Unfortunately, no passer-by even looks at him. I count only ten rupees collected on his handkerchief spread on the floor. I add five rupees to it, but I he needs not less than Rs 30 for dinner at night, I guess.